UNHCR, the UN Refugee Agency, in cooperation with the municipality of Tripoli, Peloponnese, today launched a programme to provide 300 places in apartments and support services for refugees in the city. The new places will be located in 50 apartments in Tripoli in the latest expansion of the ESTIA – Emergency Support to Integration and Accommodation programme, which is funded by the European Commission (EC) and implemented by UNHCR in close cooperation with the Ministry of Migration Policy. The programme has helped some 42,000 refugees and asylum seekers so far with suitable accommodation. The ESTIA programme will be implemented in Tripoli by Parnonas, the development company of Peloponnese. “We are focusing our efforts on supporting the integration of refugees in the life of the city,” said Dimitris Pavlis, Mayor of Tripoli, at the launch ceremony. With today’s ceremony, 15 municipalities (in Athens, Thessaloniki, Livadia, Crete, Trikala, Nea Filadelfeia – Nea Chalkidona, Karditsa, Larissa and Tripoli) are now taking part in a scheme offering accommodation and integration prospects to asylum seekers. According to Philippe Leclerc, UNHCR Representative in Greece, this shows the local authorities’ capacity to support the reception of refugees, as well as their ability to implement projects supported by the EC. The General Director of Parnonas, Beretsos Marinis, thanked the municipality for their close cooperation during the preparation phase while highlighting that all local actors in the city should take an active part in the smooth and successful implementation of the programme. 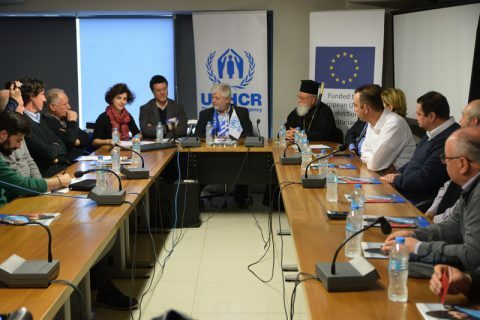 Metropolitan Alexandros of Mantineia and Kynouria reiterated the church’s support to refugees and expressed his wishes for this endeavor. In the framework of the ESTIA programme, implemented by UNHCR in cooperation with a series of NGOs and 15 municipalities, refugee families are also able to meet their basic daily needs through cash card assistance. Beneficiaries also receive social support services, psychosocial support, interpretation and transportation to and from the Asylum Service.